"Lanakila Ihiihi O Iehova Ona Kaua"
Ke‘anae Congregational Church is attractively situated on a graceful piece of land jutting out into the sea, surrounded by lauhala trees, flowers and graceful coconut palms. The church was built around 1860. At that time, the population of Ke‘anae was great. 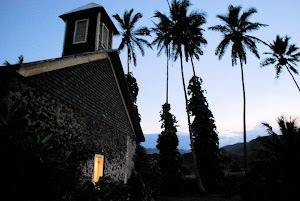 There was a protestant church located at the village of Wailua, two miles from Ke‘anae, but it was getting too small to hold all its members. 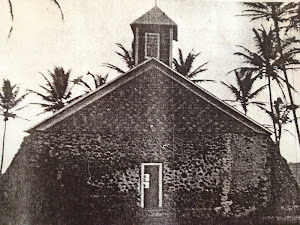 The members thought of building a church at lower Ke‘anae, in the middle where members of Nuualilua, Honomanu, Wailua, Pauwalu and Wai‘anu could walk a short distance to church and all meet at Ke‘anae. Finally the great task of building a church began. The man had used their hands and backs to do the job. The church was to be built of rocks and coral from the seashore and timber from the mountain. A few hundred men worked up to help the church, and their prayers were answered when God sent great quantities of coral on to the seashore of lower Ke‘anae. The men formed a line to pass rocks and coral from the seashore to the church site. Since there was no cement to plaster the rocks together to form the walls of the church, the coral was melted in an imu and then used as plaster and cement. The imu can still be seen on the left hand side of the entrance to the church, now covered with flowers planted by Mrs. Caroline Plunkett in 1930. Timber needed to build the roof came from the mountains a few miles away from Ke‘anae. Lehua tree beams, some 34 feet long, were also used for the roof. The beams were cut and carried to Ke‘anae by seven or eight men at a time. They would carry it a short distance before another group of men would take over. It was carried that way until they reached Ke‘anae. The beams are still in excellent condition, good for another 200 years. It is not known how long it took to complete the Church to hold the capacity of 300 people. 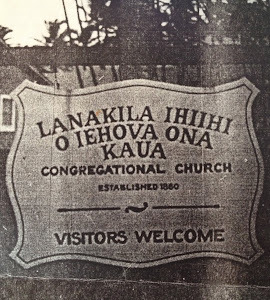 After its completion, the Church was given the name, "Lanakila Ihiihi O Iehova O na Kaua" (Sacredness, Success of Jehova, the Son of God), written on the front wall, over the altar. The fist Sunday the church bells rang, people from far and near came to worship. They rode hose back and walked miles to attend Church. The fist minister was a dynamic man, the Reverend S. K. Kamakahiki. He was a native of Ke‘anae and preached from his young days until he was old. The second minister, Reverend Kawahamae, came from the Big Island with his wife and family. He is buried at Ke‘anae Church cemetery. Reverend Joseph Paele Kalohelani was the next minister. He preached at Kaupo Church before coming to Ke‘anae. His successor was the Reverend Moses Inaina Sr., who also came from Kaupo. He preached for five years and after his marriage, he moved to Huelo Church, where he became minister. Following his departure, Reverend Alice Kaholuoluna, a pastor at Wainanalua Church in Hana, preached at Ke‘anae as well as in Kipahulu, Nahiku and Kaupo Churches. During the time of Mother Alice, the licentiate (preacher) for Keanae Church was B. K. Mololani of Kuau. He lived with Mrs. Mary Ann Pahukoa and her family for four or five years while preaching in Ke‘anae. When Mololani returned to Kuaua to live with his daughter, Rose Milikaa, George E. Akiu became licentiate. He preached in Ke‘anae for a few years then moved to Wainanalua Church in Hana, where he became a minister. He is buried at the Ke‘anae Church cemetery. John Plunkett was the next preacher, originally form Ke‘anae, where he was the boss for East Maui Irrigation Company. During his stay, he repaired the Church. He covered up boards and the inside walls which were also made of rocks and coral. At that time he also boarded the wall bearing the church name, "Lanakila Ihiihi O Iehova O na Kaua". Next to serve in Ke‘anae was William Crisp Jr., from Ohio. He was the first Caucasian to be minister of Ke‘anae. Ministers who served briefly at Ke‘anae after Reverend Crisp, include: Reverend John Kalili, Reverend William Kaina of Kaua‘i and Reverend James Merseberg of Pearl City, O‘ahu. 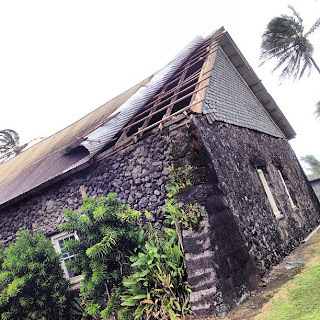 As years went by, Ke‘anae Congregational Church's membership grew less and dropped to just a handful, who worshiped in a building with a sagging roof and ceiling. In October of 1968, Harry K. Pahukoa Jr., treasurer and moderator of Ke‘anae Congregational Church was influenced by his mother, Mrs. Mary Ann Pahukoa, to repair the Church. The families belonging to the Church did not want to see it fall. Apparently a believer in the old saying, "Where there's a will, there's a way", Pahukoa, after checking the Church bank account and finding the financial status weak, convinced a carpenter friend, David Pu‘u Jr., to assist him in renovating the Church, especially the roof and ceiling. He also received generous response to his letters, asking for contributions from the people of Maui and elsewhere. Ke‘anae Congregational Church was built in 1860. The last major renovation took place in the mid 1960's. Since then, we've only had the means to carry out a few minor repairs. During the month of February 2013, a quarter of the church roof was severed by high winds and rain storms. We are humbly accepting donations to cover the cost of materials for the repair of the roof and windows. If you have other intentions or means of helping this restoration effort, please feel free to email keanaecongregation@gmail.com or call Sandy Hueu at 8082488031. Ke‘anae Congregational Church was built in 1860. The doors to intentful prayer have always remained open and visitors are invited to walk through the Church all year long. Many a Ke‘anae visitor alike, have come here for peace and reflection. Please feel free to share any stories you may have.